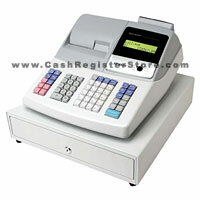 Sharp XE-A404 Electronic Cash Registers at Cash Register Store. The Sharp XE-A404 replaces the discontinued XE-A403. The cash register features 1800 plu's, 99 departments and 40 clerks. 20 one touch department keys are standard for quick touch access to popular selling items. A dual station thermal printer prints a receipt for the customer and constantly prints a journal to go back and verify a previous sale. The cash drawer is of metal construction with a removable 5 bill/6 coin cash tray. A new function added is an SD memory slot. Plug in a SD card and save a backup of your program. Free software is included with the XE-A404. This software has many useful features including cash register programming with secure back-up on the PC. Customize your own graphic logos by importing bitmap images and dropping them into the program. Upload sales reports at the end of the day to easily visualize sales trends. for Quickbooks users, a Quickbooks link is included to export sales data directly to Quickbooks.